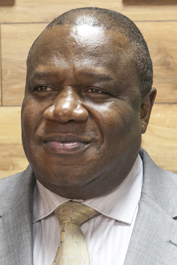 United Nations Secretary-General António Guterres and African Union Commission Chairperson Moussa Faki announced on 3 April 2017, the appointment of Jeremiah Nyamane Kingsley Mamabolo of South Africa as Joint Special Representative for Darfur and Head of the African Union-United Nations Hybrid Operation in Darfur (UNAMID). Mr. Mamabolo has been serving UNAMID as Acting Joint Special Representative since the departure of Martin Ihoeghian Uhomoibhi of Nigeria on 4 January 2017. Mr. Mamabolo brings to the position first-hand experience in dealing with the situation in Darfur, as well as expertise from his distinguished career in the diplomatic service. Since 2016, he served UNAMID as Deputy Joint Special Representative for Pillar I, overseeing political, human rights, and legal aspects of the Mission’s activities. He served as Permanent Representative of South Africa to the United Nations (2013-2016), during which he also acted as Chair of the “Group of 77” developing countries and China. Mr. Mamabolo was previously High Commissioner of South Africa to Nigeria (2009) and facilitated peace processes in the Democratic Republic of the Congo and Burundi as his country’s Special Envoy to the Great Lakes region (2006-2009). He also served as Deputy Director-General for African Affairs in the Ministry of Foreign Affairs (2002-2006). Mr. Mamabolo has held other senior positions, such as the Permanent Representative to the African Union, accredited also to Ethiopia, Sudan and Djibouti (1999-2002). During that time, he led efforts to promote dialogue in post-war Sierra Leone in his capacity as Special Envoy of the African Union to Sierra Leone and the Mano River Basin (2001-2002). He also served as High Commissioner to Zimbabwe (1995-1999).